Welcome to the University of Michigan, a place with deep traditions focused on creating brighter futures. We invite you to explore the diverse and vibrant community that makes us the home of Leaders & Best. 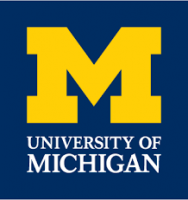 The University of Michigan was founded in 1817 as one of the first public universities in the nation. It was first established on 1,920 acres of land ceded by the Chippewa, Ottawa, and Potawatomi people “...for a college at Detroit.” The school moved from Detroit to Ann Arbor in 1837, when Ann Arbor was only 13 years old. The city had a booming population of 2,000, a courthouse and jail, a bank, four churches and two mills. It had been established in 1824 by two Easterners, John Allen and Elisha Rumsey. The town was named to honor the wives of the founders, Mary Ann Rumsey and Ann Allen, and the natural arbor created by the massive oaks in the area. It took four years to build the necessary facilities for the new campus in Ann Arbor. The buildings consisted of four faculty homes and one classroom-dormitory building. (One of the homes is still standing and is now the President’s house.) Cows owned by the faculty grazed over much of campus. As late as 1845 the campus was covered in the summer with a crop of wheat, grown by a janitor as part of his remuneration. Faculty families harvested peaches from the orchard of the old Rumsey farm, and a wooden fence ran along the edge of campus to keep University cows in and city cows out. In its first year in Ann Arbor, the University had two professors and seven students. There were more Regents (nineteen) than faculty and students combined. The reorganized University did not have a president, but the faculty elected a presiding officer each year from their own ranks. Freshmen entering in 1841 (women were not admitted to the University until 1870) took admissions examinations in mathematics, geography, Latin, Greek, and other subjects. They also had to furnish “satisfactory testimonials of good moral character.” Students paid an initial admissions fee of ten dollars but no tuition. In 1866, Twenty-five years after the move to Ann Arbor, the University of Michigan became the largest university in the country, with 1205 enrolled students. In 1867, the enrollment reached an all-time high of 1255 students. At that time, the University was comprised of the Medicine Department, with 525 students; the Law Department, with 395 students; and the Literary Department, with 335 students. There were 33 faculty members. Today, the University of Michigan remains one of the most distinguished universities in the world and a leader in higher education. It is one of a small number of public institutions consistently ranked among the nation’s best universities, and it regularly is in the top three of the country’s public institutions, with over 51,000 students and 5,600 faculty at three campuses. The University of Michigan boasts of one of the largest health care complexes in the world, the best university library system in the country, and the some of the best computer access for students and faculty of any campus in the world. Over 5,500 undergraduate courses are taught each term in over 100 programs. Undergraduate, graduate and professional students have a choice of 17 separate schools and colleges, 588 majors, over 600 student organizations, 350 concerts and recitals every year, as well as hundreds of speakers, symposia, films, and readings.